The state budget for the new Iranian year starting on March 21 assumes $21 billion of oil revenues, about 28 percent lower than this year’s budget, Government spokesman Mohammad Reza Nobakht has said. “Oil revenues in this year’s budget were worth $27 billion, which will decline by 28 percent next year to $21 billion,” Nobakht told IRIB TV3 channel Tuesday night. 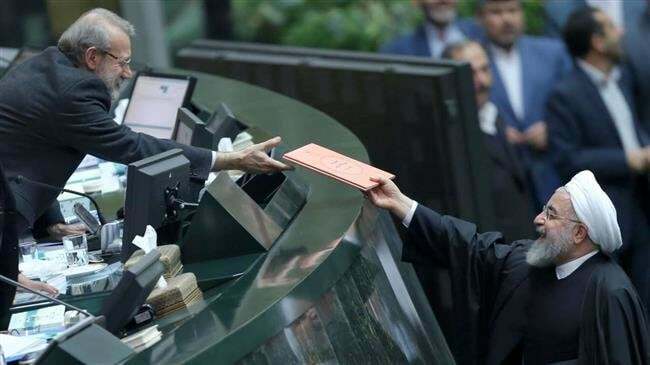 Earlier in the day, President Hassan Rouhani said 1,425 trillion rials (33 percent) of Iran’s income will come from oil exports as he unveiled the budget of 4,700 trillion rials ($112 billion at the official exchange rate) for the new Iranian year. He did not specify the average oil price assumed in the budget but officials have said the calculations were based on a forecast crude price of $50-$54 per barrel and exports of 1 to 1.5 million barrels per day. Iran’s oil sector is facing new US sanctions which are said to shave off about 1 million barrels per day of its oil sales. Eight major importers of Iranian crude oil have received US exemptions which will last up to 180 days since the sanctions came into effect in early November. Chairman of India’s biggest state-owned crude oil refiner Indian Oil Corporation Limited Sanjiv Singh on Tuesday was quoted as saying that Iranian crude is extremely important for sustaining a balance in global oil trade. India is the second largest customer of Iran’s oil and Singh said he hoped the US will extend the waiver after six months. By continuing to buy from Iran, he said, India has also been able to sustain a balance in the market. “In fact, India has played its card very well — while it has not buckled under the US sanctions, it has continued to get reasonable supply from Iran,” he said. Senior officials in the government said India is likely to continue purchasing oil from Iran in 2019, although at lower levels than the previous year, the daily the Hindu Business Line said. “New Delhi is expecting a positive result when the US reviews the waiver,” the paper said, citing government officials. “India had extensive discussions with the US on the country’s oil economy and how getting reliable and cheap supply was essential for economic growth. We clearly communicated that till we have access to alternatives, we cannot bring down our imports from Iran sharply,” it cited an unnamed official as saying. India and Iran, however, have yet to resolve the way in which payments have to be made for oil. New Delhi is keen that the rupee payment mechanism will be used but alternative mechanisms, in which payments are made through currencies other than dollar, are also being examined. President Rouhani said on Tuesday that Iran’s heavy reliance on oil revenues makes the country vulnerable to sanctions. “If the private sector had been active in the country … and if the budget had not relied heavily on oil, the impact of sanctions would have been much less,” he said. “If the structures had been healthy, I can claim that we could have had a budget without oil this year and last year,” the president added. Through the sanctions, Rouhani said, the United States is pursuing two goals: to make the Iranian people lose hope in the establishment and the country and portray the system ineffective and not in control. “No one can say that sanctions will not negatively affect the country’s economy and the lives of people, but nobody can say that America will achieve its goals,” he said.